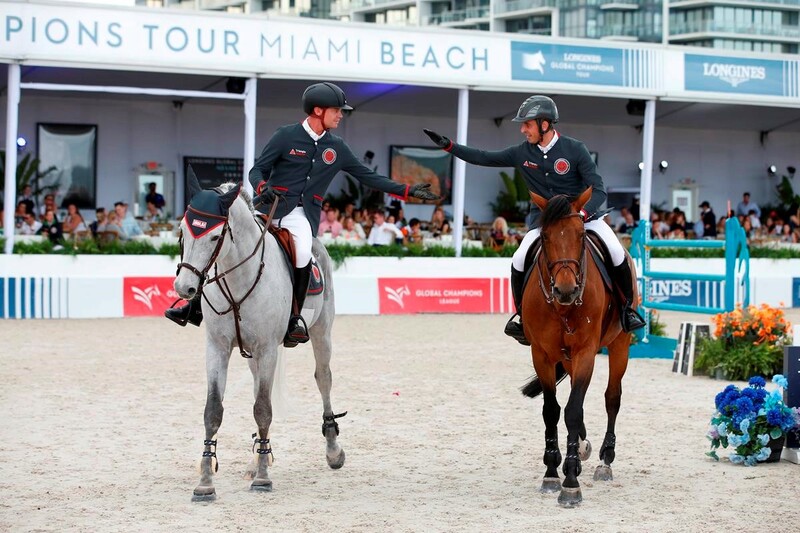 The first round of GCL Miami Beach kicked off with the Monaco Aces’ formidable duo of Jerome Guery and Julian Epaillard taking an early lead at the spectacular US destination. From the start, team strategy and tactics were clear, with many fielding their star strikers for the second leg of the Championship race. With every point counting as the teams look to the GC Prague Play Offs, every decision will come under scrutiny as the season long battle unfolds. Fans packed the length of the arena, just moments from the picture-perfect Atlantic ocean, and were treated to a world-class display of top sport and show jumping expertise. Despite the heavy-weight line up, today’s course challenged the very best in the sport and after the only double clear in the intense team competition, the Aces are in the driving seat heading into Saturday’s GCL Miami Beach climax, which promises thrills, spills and drama. The Scandinavian Vikings sit second on four penalties following punchy efforts from Leopold van Asten and Christian Ahlmann, with the Prague Lions taking third with six faults, represented by Gerco Schröder and U25 rider Anna Kellnerova. The Doha Fursan Qatar team (Sheikh Ali Al Thani and Bassem Mohammed) are also on six penalties, but lie in fourth due to their combined slower time. After the first 29 riders of the 57 starters in the CSI5* 1.50m speed class there was not a single clear inside the time. Then, with the watching crowd hoping for a change of trend, three came back to back. The first was greeted by cheers – produced by Leopold van Asten on the 11-year-old Chaco-Blue mare VDL Groep Miss Untouchable, swiftly followed by classy, clean rounds from both representatives of the Monaco Aces, Guery and Epaillard, both of whom hinted at what was to come when they finished in the top eight of the earlier class in the day. Faults were evenly spread around the 13-fence course, with fences that appeared fairly straightforward when walking the course — like the stand-alone oxer at fence two — taking out some of the biggest names in the competition. The winners from the opening 2018 leg in Mexico City, the Miami Celtics, had a favourable late draw, but were among the in-form combinations to run into some problems on this course. Michael Duffy and EFS Top Contender had one down and one time fault, while his team-mate Denis Lynch’s strategy of a slow clear on the Nabab De Reve stallion came unstuck at the upright fence nine, and picked up two time faults for the team to finish on 11 faults, relegated the home favourite into 11th place. Despite strong efforts from Valkenswaard United’s Alberto Zorzi, Cannes Stars’ Jane Richard Philips, Berlin Eagles’ Christian Kukuk and St Tropez Pirates’ Pieter Devos the 73-second time allowed proved influential, with all collecting a fault for their respective teams. Last year’s winners the London Knights had a pole down each, with Ben Maher and Nicola Philippaerts teaming up for the first time to finish in 6th – both riders hungry to reclaim a podium position on Saturday. But the Aces were the team to come up trumps in today’s tantalising face-off, with thoughts now turning to which horse and rider combinations will be fielded for Saturday’s showdown. Germany’s Marcus Ehning won the class individually — the maestro part of the Valkenswaard United squad, but not representing them in this class. Ehning finished streets ahead of his 56 rivals, completing the course in a blistering 66.42 seconds. He rode an exceptionally smooth round on the nippy Cristy, a Zangersheide mare by Canturo, shaving lines and taking out strides while never looking hurried. Friday will see two CSI5* classes before Saturday’s final day, where riders will compete for the GCL Miami Beach win and a chance at the prestigious Longines Global Champions Tour Grand Prix of Miami Beach accolade. For all the information and the upcoming schedule, please click here. For the full GCL results, please click here.